Damn right Jimmy Key was an all-star back in 1987. He posted an 17-8 record with a league-leading 2.76 ERA for crying out loud. He didn't have a blazing fastball but instead used awesome Maddox-like control to consistently win ball games. What I liked best about Jimmy Key is how he wrapped up his career with the Jays. 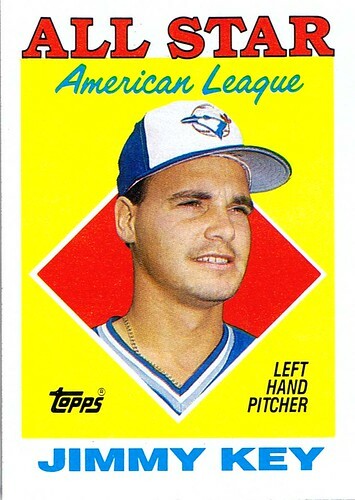 He made his final start for the Blue Jays in game 4 of the 1992 World Series, surrendering one run over 7 2/3 innings to earn the win and put the Jays up 3-1. Key would appear once more in the series, as a reliever in the 10th and 11th innings of the 6th and deciding game, earning the win. It's him and Jim Clancy all the way. Don't forget The Tao of Stieb. That Game 4 remains my one and only WS game attended live to date. Jimmy was really on his game that night. And just to answer my own trivia question from a while back... Duane Ward was the winner of the other two games the '92 WS. Game 2 on Ed "Creatine" Sprague's pinch HR and Game 3 on Candy Maldonado's walk-off single. I have his basball card in mint condiction!!!!! !